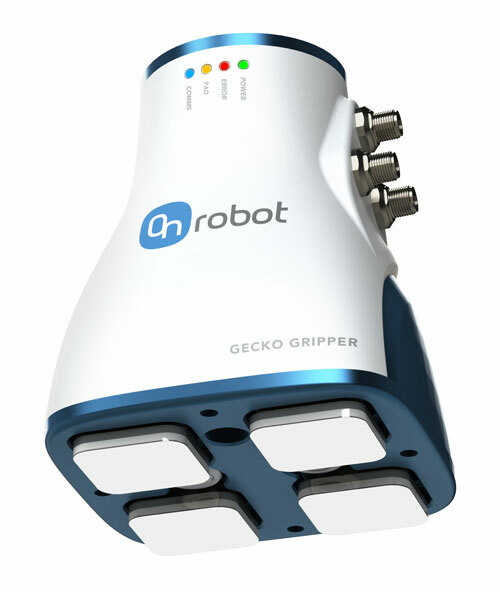 The new Gecko Gripper, an end-of-arm robotic gripper from OnRobot, employs NASA-created technology to replace vacuum products to adhere to surfaces. The technology, initially based on the gripping capability of gecko lizards (hence the product name) was developed through Stanford and NASA research, followed by multiple industrial collaborations. It employs millions of micro-scaled fibrillar stalks that adhere to a surface using van der Waals forces, enabling robots to pick up flat, smooth objects with significant energy savings, according to company officials, over existing grippers such as vacuum grippers, which require compressed air. The gripper interfaces with any robot and reportedly offers rapid ROI based solely on the electricity required to compress air. The grippers affix to a range of surfaces, including those that vacuum grippers can’t handle, claim OnRobot officials, who also state that the grippers also offer competitive advantages over electrostatic grippers, which are weaker and require high-voltage systems to operate.